Today was all about moments here and quickly gone. When driving down the road this morning, I saw the first crested dwarf iris of the season. These are perhaps my favorite spring flowers...but I was in a hurry so I could not stop and smell the iris. Next, I worked and worked and worked...but finally found an hour to comb through the yard and woods in search of objects de spring. I noticed that my my currents are finally setting their fruit and hopefully will produce a decent crop this year. Then I regarded my creeping phlox stretching lazily in the sun over my rock garden. I took a walk with Harley in search of signs of sprouting ginseng, but it is still too early for them to peep through the soil. I did find pink lady slippers. I took photos. 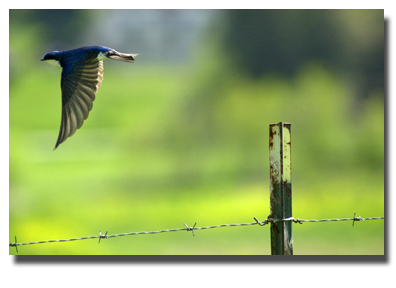 Later, while waiting for my children to finish their afternoon activities, I took a walk in Valle Crucis park where I found the swallows thriving on early insects in man-made habitats. I like this photo only because I feel that I have caught the sucker. These dudes are quick. If you have ever been dive-bombed by them when you accidentally get close to their young, then you know exactly what I'm talkin' about. If you are a mom, then you know that the months of December and May tend to be overwhelming. It seems to me that this year, the months of Sept-May have been one big blue. I learned how to say 'No' when I was 2 years old, yet that does not stop folks from askin' for all kinds of photographic favors. 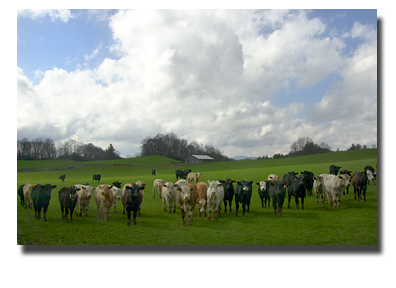 I found this photo of bloomin' creasy greens in a field across from the Mast Store Annex in Valle Crucis. I used a polarizing filter but I am not convinced that it helps much other than to help boost the blue of the sky. My goal for the day was to try to capture the spring green on the trees but digitally I haven't won that battle yet. I have been consumed with spring time sports...I run from track meets to baseball to soccer to softball. Lately I have been in my digital darkroom until 11 pm. My daughter plays JV softball and because of my job, I've only seen her play twice this season. Thankfully, my husband goes to all her games...but I can't help but resent missing out on her action. Today I blew off a varsity baseball game to shoot and watch my daughter play a game. She rocked! She is a catcher and is small but fiesty...I am sure the sports editor will not approve but I am sure that I don't care right now. That is all. It was pouring rain yesterday, but that didn't stop me from parking my car and dashing out to capture this old barn that sits on Hardin Street near Dauph Blan Rd. 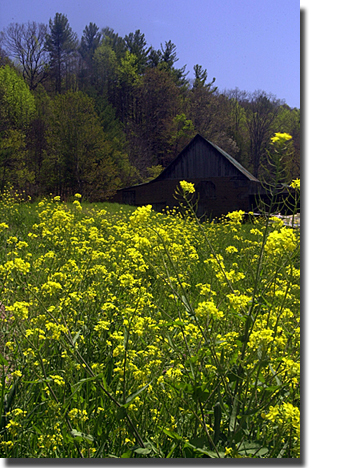 The barn is completely surrounded by Appalachian State University. I know in my heart that it is destined to be replaced one day and I made a promise to myself this winter to try and get shots of it before it disappears. Despite the rain, yesterday seemed like the perfect day to capture its image. 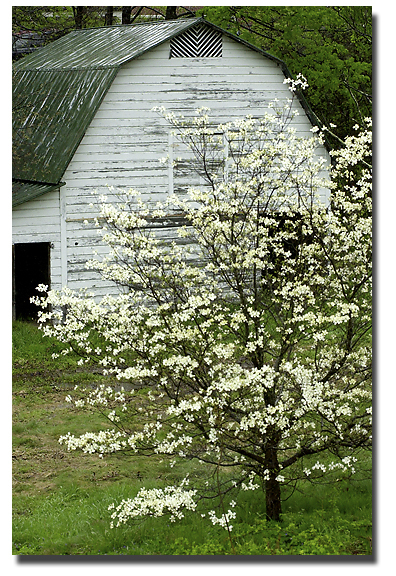 In my research on the barn I did learn some locally interesting trivia. The name Dauph Blan is a contraction of the names of the two fellows who founded Watauga Academy: Dauphin Disco Dougherty and Blanford Barnard Dougherty. I think their mama must have a some kind of sense of humor. I promised trip photos and you shall receive them shortly. I worked at editing and prepping last night and think I'll just create a photo album so that I don't bore any of you who are not interested. So I'm sunburned, back at work and behind on housework, yet still deliriously relaxed having returned from our whirlwind tour of the NC Outer Banks. I have plenty of photos and stories to share. The students were fantastic and everyone came home mostly unscathed. I learned that 8th graders are mostly human and require constant feeding. Our formula of keeping the children constantly active helped everyone sleep better at night. The folks at the Duke Marine Biology Lab on Pivers Island were our gracious hosts. I did not take my Nikon D1 to record the trip because I thought it might be too heavy and restrictive. Instead, I shot with my trusty Nikon Coolpix 990. It is several years old and is fun, but slow, to use. 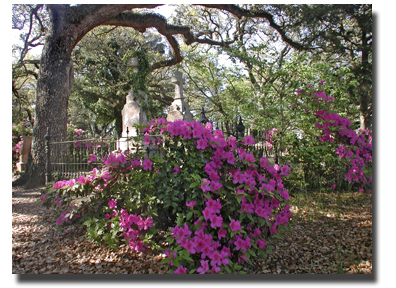 The shot above is of the Beaufort Burial Grounds. All the graves are sheltered by the sprawling arms of oak trees and azaleas frame many of the head stones. I love the dappled lighting, but it was hard to capture this using my Coolpix. 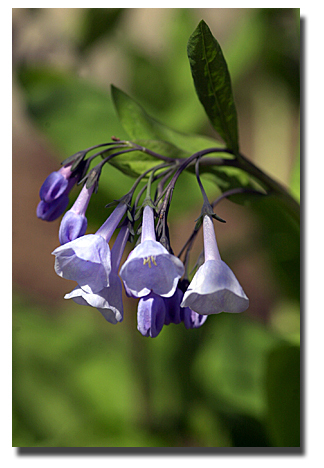 My friend Jerry has a magnificent green thumb and he informed me earlier this week that he had some lovely Virginia Bluebells currently in bloom. He wasn't home when I happened by, so I snuck into his garden and found blue flowers in a bell shape. Hope these are indeed bluebells. The true blue of the flowers is difficult to capture digitally. The photograph above shows them more purple than they are in real life. Imagine a Carolina blue sky but a bit softer (no polarizing filter added) and that is the color of these bluebells. One last thought....I'm gonna miss all of ya'll. Over the past 6 months, there have been precious few days that I haven't peeped into your lives and on this trip I won't have an opportunity to post or peep. But, keep postin' cause I intend to play catch up! Just a quick post to let you know that I am trying my best to get off the computer and out of the house. Yesterday was mostly spent shooting for the newspaper. I did manage to get this shot of a cluster of bloodroot. On a quick walk through my woods I noticed the forest floor is carpeted in hepatica. I saw signs of the crested dwarf iris promising to bloom in the next couple of weeks. I've gotta go...I want to accomplish alot today. The microclimates of our area never cease to surprise me. We have a red maple tree in our yard and it tends to be ahead of Mother Nature's schedule. It has buds and leaves before trees in the valley even think about putting out buds. I hang my only bird feed from this maple trees. Today there was a buzz of activity. 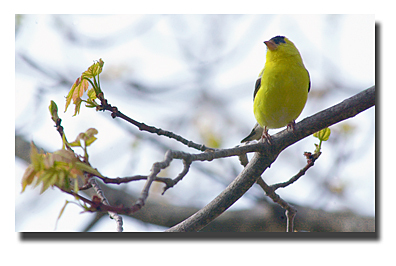 I noticed the usual titmouse and nuthatch grazing, but also saw several goldfinch. To get this shot I decided to park my car ( a comfortable blind) as close to the tree as I could and lowered the window just enough to get my lens through and I waited and waited....and waited. Finally a goldfinch decided that my car was not going to eat him and he posed for me. My weekend plans include packing for VACATION. Yep, I'm taking some paid time and heading to the beach for about 5 days next week. It's gonna be just me, a couple of teachers, and well, 35 teenagers--all 8th graders. We are going to the Duke Marine Biology Lab in Beaufort, NC. We are taking a research vessel out to sea and dredge the ocean floor just to see what we can pull up in the net. We are going to perform post-mortems on dolphins and sharks. We are going to kayak through estuaries. We will get to watch sea turtles born in the lab's hatchery. We get to mingle with Kangaroos (courtesy of the NC Zoo). We are going to shop in cheap beach stores.We get to play in the waves and cook out on the Outer Banks and much, much more. This is not the typical family vacation to the beach and I can't wait! Ya'll please keep your fingers crossed for good weather. I went last year on this same trip with my eldest daughter and had so much fun getting to know the other children that I took on the responsibility of planning this year's trip just so that I could go again and share it with my youngest child. Duke is trying to encourage middle school children towards the study of the science and has graciously allowed 8th graders to mingle with their graduate students for the week. Our middle school science teacher is young, enthusiastic and embraces every opportunity to teach students. He makes science fun. As a result, both of my girls have decided to take lots 'o science in High School. One excellent teacher can make a difference. 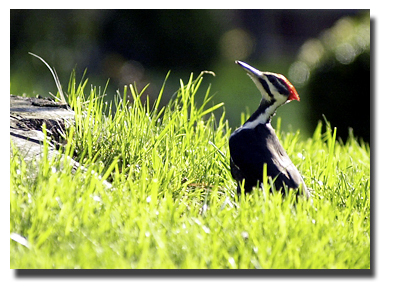 This morning while looking for Home & Garden photos, I happened upon this pileated woodpecker. He was grubbin' around in the grass of somebody's yard having a field day. I managed to get my 200mm lens mounted on my camera and ease the window down on my Jeep in time to fire about 3 frames before it got antsy about my presence. As I watched him fly away, all I could think was what a magnificent looking creature it is...too bad it is not pretty sounding as well. We woke to find a thin layer of snow on our world. I dutifully got out of bed and made coffee. My husband opened his eye, looked out the window, then pulled the covers back over his head. He's in denial. 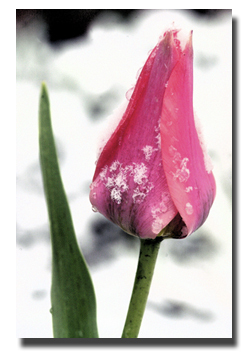 I found this brave tulip in a flower bed outside the Daniel Boone Inn. I picked up my daughter's new friend today so that they could hang out a little during spring break. I'd never met this child before even though my daughter had often talked about her. I was more than happy to introduce myself to her parents and make the necessary parental offerings of friendship. However, when I asked my daughter if I could speak to one of her parents via telephone, she muzzled the phone and said, "They aren't around, you have to speak to her uncle." Unprepared, I introduced myself to voice on the other end. It was her uncle who said, "Both her parents are career soldiers currently in Iraq. We thought that they would be home by now, but apparently they have been called for prolonged duty so we are not sure when they will return." Geez,what do you do? Carry on soldier! Here is a normal teenage girl, sporting a Marine sweatshirt, climbing into my Jeep. She and my daughter were giggly and planning a silly trip to our small mall. Her parents have not been around for more than a year...she obviously has a great supportive family...yet, I sit here listening to my president at a press conference and can't help to feel that the world is so freakin' small right now.